CREATED WITH ANIMALS MOUNTED ON MOVING TARGETS IN RIVER ENVIRONMENT. KIDS RODE A BOAT MODEL AND 'HUNTED' FOR CRITTERS IN THE DARK. CREATURES' EYES LIT UP WHEN THEY WERE CAUGHT IN A FLASHLIGHT BEAM. THE THREE LOWER PHOTOS SHOW EXHIBIT UNDER CONSTRUCTION. 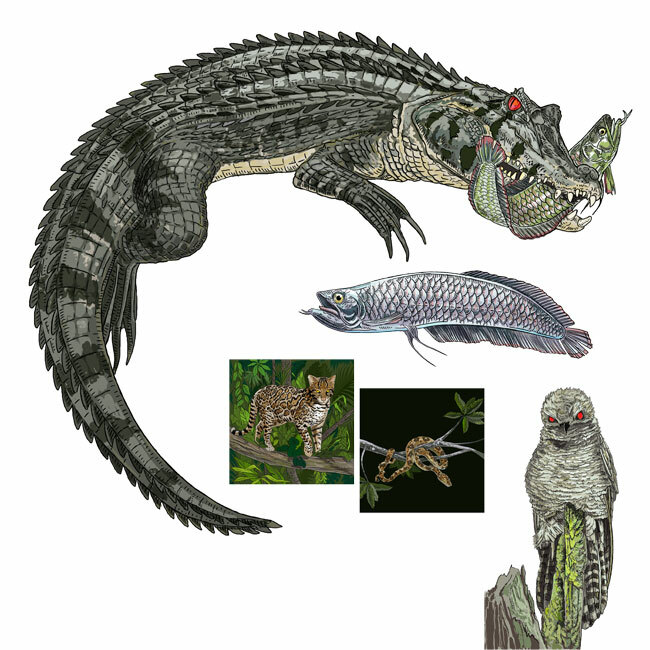 ANIMALS SHOWN: BLACK CAIMAN, AAROWANA, OCELOT, TREE PYTHON AND POTOO. THE TRAVELING EXHIBIT WAS FUNDED BY THE NATIONAL SCIENCE FOUNDATION & PRODUCED BY THE MIAMI MUSEUM OF SCIENCE.